After riding Velib all over Paris, my mind changed on city-wide bike share. Go big or go home was the declaration, meaning if you’re going to deploy a successful share, do it across a city so cyclists can ride from one station to the next. And that’s what NYC has done like Paris, Montreal, and DC. After software delays and flooding delays, NYC Bike Share is live and happening now. 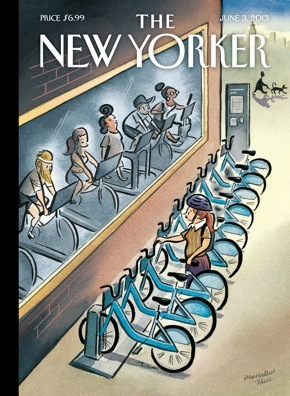 So significant a change for the city, it made a New Yorker Cover. In an interview, the illustrator Marcellus Hall said, “I’ve only been ‘doored’ twice and continues to explain how he survives managed to survive for fifteen years as a cyclist in the city. It’ll probably prove the best way and to his point, the last time I rode in NYC, our group got attacked. There’s only so much space there and while they’ve added 350 miles of bike lanes, “I hope nobody gets hurt,” Mr. Liu told the NYT. But this is thousands of bicycles on the streets of Manhattan, used by people who haven’t ridden bikes on the streets of Manhattan. True and they figured it out in Paris and London, where Boris bikes led to an economic boom. After all the complaints, expect they’ll figure it out in NYC too.